He seemed to materialize out of nowhere. An androgynous young sub-genre big hair harbinger of glitter-glam, rock and roll to come. A drifter in the desert with a shy voice and “Come, they told me, pa rum pa pum pum. Me and my drum”. It’s tax time and everyone’s got to pay up. While in one part of town Mary and Joseph are looking for a manger, scheming talent promoter Ben Haramed and his medical doctor wannabe side kick Ali are stuck without means. As serendipity would have it, they stumble upon a young, naive and especially besparkled Ziggy and his two beloved childhood animal buddies Samson and Babaa wandering on the fringes. An orchestration of cha chings sound immediately in Ben’s inner ears. After a brief kidnapping and a bit of family flash-back persuasion, the whole band begins touring, Spinal Tap style until a renowned and powerful music agent creates Ziggy Stardust as a world-wide phenomenon. Then all bets are off. Except for Ziggy’s parents, uncle and aunt who might be stuck on Mars. (NO ONE could have seen THAT coming!) It’s a tale of Changes, forgiveness and Modern Love, in Little Drummer Bowie at The Falcon Theatre. A very first step in to The Falcon emerged as a ‘night to remember’. 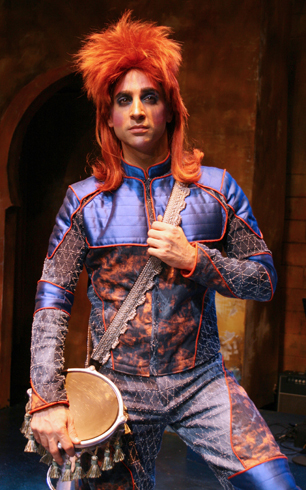 The award-winning Troubadour Theater Company did nothing to blemish their stellar Laugh-In reputation in this musical re-imagining of the drummer boy classic as a spoof on glam rock icon David Bowie. Matt Walker and Joseph Leo Bwarie (also lead character Ziggy) have directed this piece to perfection in all its spontaneity and more. One cannot even begin to fathom the depth of insanity until experiencing this show. Recognizably ridiculous gags, deft delivery, lightning pace and a bit of cutting edge political humor all collide for a blaring, boisterous night. Joseph Leo Bwarie (Ziggy) most widely known for his record 2,000+ performances as ‘Frankie Valli’ in the Tony Award-winning musical Jersey Boys on Broadway, is solidly exceptional in every way. Every bit from costumes to lighting to wigs, choreography and music arrangements to the live onstage band hit the mark 100% and then some.